The holidays are only a few weeks away and while the rest of the world is preparing for Christmas and New Year festivities, Persians are looking forward to winter solstice celebrations (Shab-e Yalda) in the northern hemisphere. For the rest of us in the southern hemisphere, days are getting warmer and longer and we are eating summer foods already! Winter solstice is another topic which we will talk about later. If you are lucky enough to be somewhere very hot, then you'll be feasting on plenty of salads and summer fruits. We have started our summer feasting with a chilled yoghurt soup perfect for lunch on a scorching hot day. If you have baked lavash before (or used our recipe) then, it is easy to take it to the next level by adding some nigella seeds and grated Parmesan before baking it. If you are in the mood to make lavash crackers, you can dry them in the oven (100C for 20 minutes) and store them in a cookie jar. 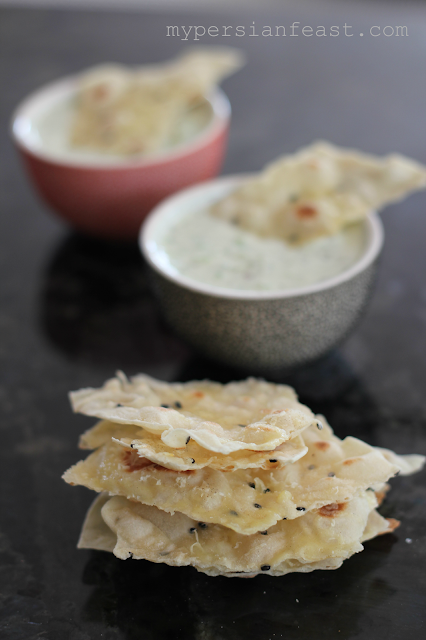 Lavash crackers are not only great for dips but you can eat them with salads and chilled soups. Sprinkle cucumbers with salt, leave for 5 minutes and squeeze the juice out. 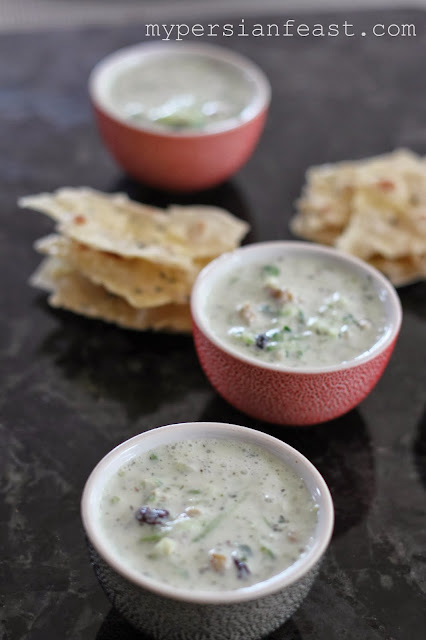 Few minutes before serving, add generous amounts of croutons or lavash to the soup or serve it on the side. If you are serving it outside, add a few ice cubes to the soup. The other day, maman and I spent an entire day in the kitchen baking bread, cookies, cake and making sesame snaps. Maman loves to share food stories and talking about my grand-father. She often tells me that her dad was not only a super-talented DIY master and everyone's go-to person, he was a farmer, a hunter, a traditional folk singer, and a flutist. She told me how he used to harvest sesame capsules in the summer before they turned slightly yellow. Sesame pods were then sun dried and the little white seeds were collected and stored in a dry place. I had a picture of a sesame tree in my head for so long that I was so devastated to find out the truth about where sesame seeds came from. Maman still makes our favourite foods and like every good mother, she cleverly alters them to make them very hip and be better for our health. I just got back from Alice Springs and my body must have reacted to the massive change of climate and I came down with a mysterious flu. She added two heaped tablespoons of manuka honey to the melted sugar before adding the sesame seeds while she was telling me about the magic of manuka honey. 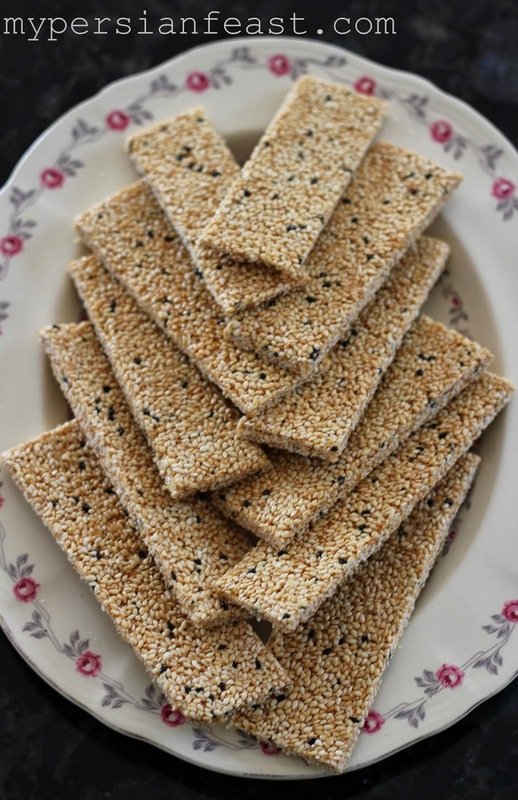 The name of sesame snaps in Persian is posht-eh zeek meaning the back of a little spotted bird. New Zealand is blessed with beautiful varieties of honey. Twenty years ago when we settled into our new life in New Zealand, we ate our way through few jars of honey before we picked manuka honey as our household's favourite honey. Like a childhood favourite, manuka honey has embedded into our minds that without thinking we reach for a jar of manuka in the supermarket. Last year, maman and I arrived on a very early flight to Zurich and made our way to the airport lounge for a lie down and breakfast. Naturally, I piled up my plate with cheese and plenty of chocolates, and maman with honey and fancy fruit preserves. Maman never judges anyone's food (unlike me! ), but on that morning eating honey on gourmet bread, very puzzled she asked "how did the Swiss get honey so wrong?" ... well, NZ honey does not compare to anything in my opinion. This week is national honey week and no better way to celebrate it but with manuka honey I say! This is maman's recipe which is a National Honey Week Recipe for you to enjoy. Place sesame seeds in a large fry pan. On low heat toast the sesame seeds until golden (takes 10-15 minutes). Stir continuously when the pan is very hot to avoid burning the seeds. Butter a large chopping board, rolling pin and a knife. In a fry pan, melt the sugar until golden. Add butter and stir to melt. Turn the heat off and add honey, stir to mix. Add sesame seeds and combine with the syrup. Turn the mix onto greased chopping board and roll it to about 2mm thickness. 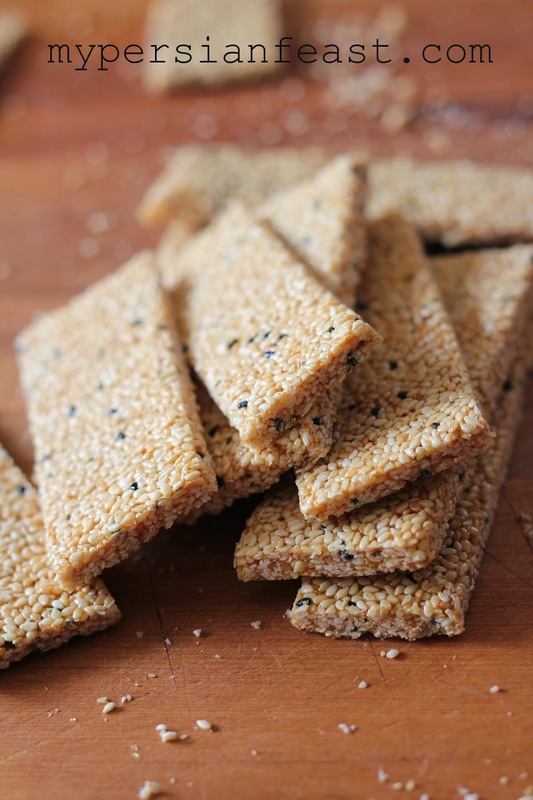 Cut the sesame snaps to any size or shape you like. Lift each sesame snap with the same knife (this should be easy if the board is greased well) to stop it from hardening onto the board. Alternatively, you can roll it between two sheets of baking paper. Allow to cool and store in an air-tight container. Taste of Auckland turned 5 this year and was everything the festival promised to be with a great line up of chefs, restaurants and gourmet products. 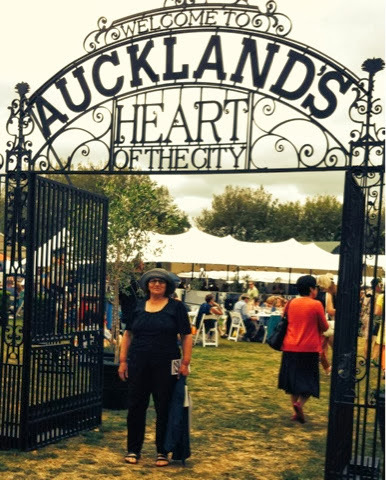 It is the best foodie festival in Auckland that brings the best of hospitality and small specialty producers under one umbrella for you to sample. It is an outdoor event, so in the event of rain you are going to get wet but, luckily the weather was gorgeous when I was there. The sun was out, the band played music non-stop and the festival was buzzing with happy foodies. The festival spending money is crowns ($1 equals 1 crown) which you purchase on a card and spend it at any restaurants or stalls. You can credit your card when you run out of crowns. This year, the winning dishes for me were from The Commons and Toto. Every year, there seems to be one or two restaurants that really do it for me. Apart from eating dishes from restaurants and sampling food from producers, there is always the Fisher&Paykel kitchen. You would think a perfect lamb roast needs a perfect oven and the guys at Fisher&Paykel have thought about it very carefully. We tried perfectly roasted lamb and guessed the ingredients which was all for fun of course. This year, Kenwood transformed their kitchen into a tea party wonderland with staff dressed in wonderland costumes! I also attended Annabelle White's Kenwood session and if you have ever been to one of her cooking demos or classes you'll know what a delight she is to watch. It was an hour of laughter and some cooking tips on the side! 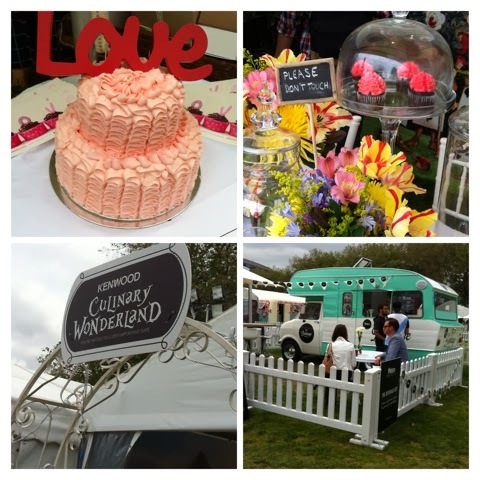 A few food trucks made their way into the festival this year, all quite retro and added the cuteness factor to the day. Cold drinks, coffee and ice creams are always available if you need to cool yourself down or warm up! The Kapiti tent and The Beverage Boy were extremely popular this year. 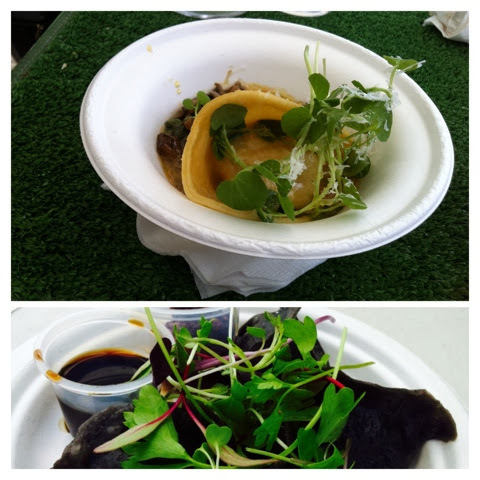 If you would like to be a little adventurous with your food then, Taste of Auckland is the best place to start! Happy mum enjoying the sun and the food!